Build 9 – Steam Trading Cards! Hot on the heels of our release is the new addition of Galacide Steam Trading Cards! Added seizure warning to splash screen. Fixed a bug with the military ship where dashing to the left and right edges of the screen teleported you to the top or bottom of the screen. Possibly fixed Endless music not playing sometimes. We’re working hard to put together the official Galacide Soundtrack composed by the amazing Tom Stoffel and the Digital Art-book curated by our very own talented 2d Artist Meredith Laxton. Join our Steam Community Group to keep updated with Galacide news and announcements! Build 8 – The Final Countdown! Last November, 10 developers flew hundreds of miles from England, Australia, Germany and all over the United States, to create a new game. Tired from the trip, we spent the week relaxing, discussing and creating the foundation of a game that would become Galacide. It was developed from the start using a prototype that would drive the direction of the game. After 9 months of grueling work, exhibiting at our first conference, and opening a new office, we feel Galacide is ready for prime time. From the bottom of our hearts, we must thank you. Our readers, our players, our fans, friends and family, who have all helped support this project from inception to completion. This is a game that we’re proud to call ours, and now we want you to have it. We’re releasing Galacide to the public today, July 28th. The last Early Access content patch is releasing this morning, Build 8. It includes tons of polish, optimizations and new content. Here are some of the changes that we’ve been hard at work on for the last few weeks. Pretty much everything has been updated including the old bosses but I will just focus on two of the new ones. First off we have added fight sequences that you will encounter at the ends of levels 1 and 4. We have also added our end boss into the game, The Bit-Matriarch, you will encounter her after fighting your way through the Scrapyard! We added the final ship to the game it focuses primarily on offense with a fast shooting machine gun, missile volleys, and the ability to dash through bits and enemies. Bomb damage increased from 500 to 1200 so it now destroys most enemies. Scrap no longer fire bullets. Increased the size of Player respawn blast radius. Holding a scrap highlights all Bits of that color. Cleared Bits now spawn projectiles that damage enemies and do damage based on your combo. “Taking Out the Trash” achievement now requires you to clear 750 Bits in a level. “We’ve Got Hostiles” achievement now requires you to kill 500 enemies in a level. “The Final Frontier” now requires you to travel 500k units. Ramming Speed! Smashes through Bits in the direction being held. Unlocked by defeating the Bit Matriarch. Added an achievement for unlocking the Military Ship. Freighter now becomes unlocked when beating level 1. Ships now all have a win animation, instead of a warp-out explosion. Gun Turrets no longer spawn on the top/bottom rows of bits that are mostly off screen. Linking Turrets now maintain their link for a while after their connection goes off screen. Snake Boss spawns powerups based on the color of the scrap used to damage him. Scrap inside the Snake Boss belly is easier to see. Eradicator bombs drop experience powerups when destroyed before exploding. Added a new Eradicator boss that will appear in level 5 Desert Ruins. Added a fight sequence to the end of Campaign Level 1 – Asteroid Belt, which acts as a boss. Tutorial is now named Introduction. Remade the Tutorial to include updated mechanics and hopefully better explain old mechanics. Eradicator in Campaign Level 2 – Mine Entrance is now at the end of the level instead of in the middle. Added Campaign Levels 4-6: Debris Field, Desert Ruins, and Scrapyard. Added “Clear All the Bits” goal to Puzzle Mode level display banner. Removed combo display from puzzle mode. Changed the clear time in puzzle mode from 1.2 seconds to 1.0 seconds. Changed Morphing tier to be named Circuits. Modified some puzzles to more clearly present the mechanics they are intended to test. Added a combo counter to the hud tracks your current combo and current score multiplier. HUD elements flash when player takes damage and pulse red when health is low. Increased player ship feedback when taking damage or gaining experience. When respawning, a popup displays how many lives remain. The End of Mission screen shows a notification if you unlocked a ship or mode. In Ship Selection, locked ships show silhouettes and a description of how to unlock them. The End of Mission screen shows your max Bit combo, how much damage you took, and how many times you died. On the Star Map, difficulty descriptions now appear under the difficulty selection. Difficulty names on end screen are now the same color as the difficulty color on the Star Map. Made it so score isn’t added until you lose your combo and then it is added all at once. Score now counts up instead of just changing all at once. Made the player widget larger and added labels to it. Rearranged Star Map slightly for better flow. 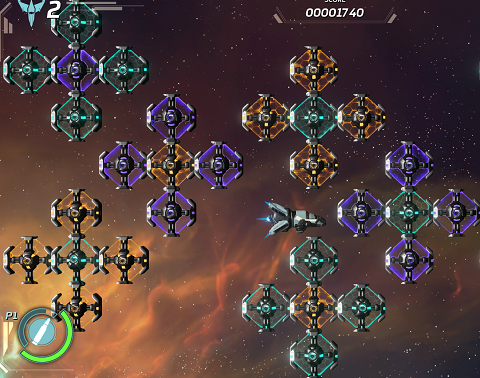 Added music to Ship Selection, Puzzle maps, Eradicator and fight sequences, the Bit Matriarch, and Victory music. Added more LOD and Material Level settings. Fixed a possible crash caused by not properly being connected to steam. We have created three power-ups to assist you as you battle the alien invaders. Teal powerups will restore a portion of your ship’s health. Orange power-ups will cause your ship to fire twice as fast and to move 50% faster for 10 seconds. Finally, purple power-ups will give you XP. Power-ups only drop from cleared bits, so make sure you’re getting as many matches as you can! We have now bound the drop scrap and use special ability to two separate buttons. On the gamepad, B drops scrap and X uses the ship’s special. On keyboard, C drops scrap and X uses the ship’s special. We have completely redone the gameplay of the game’s first level, Asteroid Field, as well as updated the background to improve the look of the level. We’ve also rebalanced the difficulties on all levels, making hard just a bit tougher, and expert even more frantic and challenging. On top of the typical enemies that you are used to seeing in Galacide, you will now notice our new swarm versions of the Sine and Seeker enemies, which will drop scrap less often. We have also altered the Eradicator 27b (2nd level boss) to ensure that the encounter is more exciting and challenging. We have done a lot of work ensuring that all of our ships are as balanced as possible in an attempt to make each ship valuable in combat. The Freighter now does more damage overall, and takes less damage when colliding with enemy ships. The Phase Ship has a longer phase cooldown, and the Mining Ship’s first-level weapon has been changed to a weaker version of its level 2 spread shot. Drop scrap and Use Special are now different buttons and can be used at the same time. Added bomb and scrap placement ghost effects. Implemented power ups that drop from cleared bits. The type of power up is determined by the color of bit it dropped from. Orange – Ship fires twice as fast and moved 50% faster for 10 seconds. Shooting a scrap on top of a power up moves the power up to the left so it isn’t stuck under the bit. These power ups have a weighting system that helps smooth out their spawn chance. Added a warp hint icon that displays on Normal difficulty when there are no bits on screen, hinting that the player can warp ahead through the empty area. Scrap and bombs spawned by the map/bit sequences are immune to tractor beams. Holding the Drop Scrap key/button (in addition to the Shoot key/button) prevents the ship from picking up scrap. Your ship can no longer be pushed off screen by bits that are currently clearing. Mining Ship level 1 weapon was changed to a worse version of the level 2 spread shot. Mining Ship special no longer turns off when a scrap gets attached. Freighter now takes less damage when ramming enemies. Freighter now does more damage on all levels. Freighter now has the option to drop scrap at any time. Phase ship’s charge shot now only penetrates if it has damage left over after hitting an enemy. Phase ship now has longer cool downs for phasing. Phase ship can now phase out with scrap attached. Player ships flash red when getting hit. Updated Sine Enemy and Beam Destroyer models. Added smaller swarm versions of the Sine and Seeker enemies that drop scrap less often. Changed enemy glow to white instead of red it it isn’t going to drop a scrap. Linking Turrets no longer play a firing sound. Updated material effects for Linking Turrets. Adjusted all enemy damage and collision volumes to be more accurate and consistent. Updated destruction effect to use a better mesh. Enemies now all flash red when getting hit, and the flash fades more smoothly. Increased the Eradicator 27b (aka boss on level 2) health, and the health of the bombs it spawns. The Eradicator’s bombs now have a chance to drop experience power ups if you kill them before they explode. Snake Boss now spawns shooters properly and they now have a chance to drop a bomb which can be used to do extra damage to the snake boss. Re-balanced the current difficulties on all the current levels. Optimized background assets for all current levels. Did a total overhaul of Level One, Asteroid Field’s gameplay. Updated background on Level One, Asteroid Field. Expert is now significantly more frantic and difficult. Added tapering bit sequences to the campaign levels so the bit walls aren’t a hard vertical wall. Level 1, Asteroid field is now locked until completion of the Tutorial. Modified Linking Turrets 5 and Morphing 3 to make more sense for the skills they are intended to test. Puzzle Mode ship now drops scrap in place and has a half second delay before picking it back up. Added a tip to the intro screen when playing any of the first 3 puzzles of each normal tier. Bits take longer to clear in Puzzle Mode to assist in completing puzzles requiring rapid action. Changed the title of the Multi-matching tier to Rapid Action. Reset save files due to overhaul of Campaign gameplay. Removed score display during Puzzle Mode. 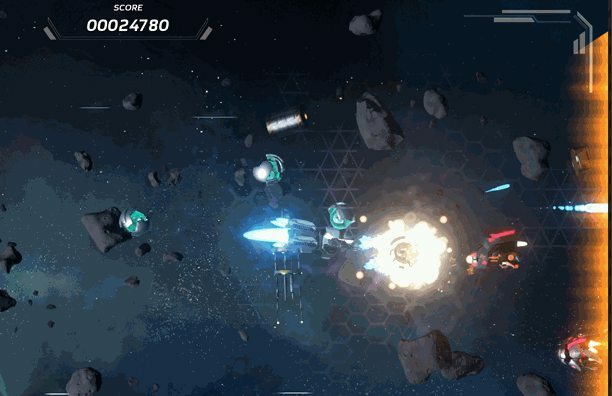 Added full screen scrolling asteroid / debris particle effect that scales intensity with camera/ship speed. Bullet particles now always render on top of explosions. The Star Map now shows the requirements to unlock each level. Significantly increased the timer for streaming graphics resources when loading a level, to prevent texture popping. Fixed scrap tracer and ghost showing up behind the bit it should appear in front of. Prevented spawning multiple player ships in Puzzle Mode if co-op was played prior to Puzzle Mode in the same session. Hey everyone! Today we are releasing an update for Galacide, which will introduce Steam achievements as well as a brand new Puzzle Play game mode. We’ve also changed the ship requirements, meaning that the Freighter and Phase Ship must now be unlocked prior to use. We have added 21 achievements to unlock, some of which include reaching a certain score in endless mode or completing a certain level. A new game mode called Puzzle Play has been added. Puzzle Play features 30 puzzles that are arranged in 5 tiers based on what mechanics they test. Tier 1 tests basic matching skills, including morphing. Tier 2 focuses heavily on morphing. Tier 3 challenges the player to create multi-matches. Tier 4 tests the player’s ability to predict how Linking Turrets will reconnect when their connected turret is destroyed, and introduces bombs. Finally, Tier 5 tests players’ knowledge of the most advanced concepts of Galacide. 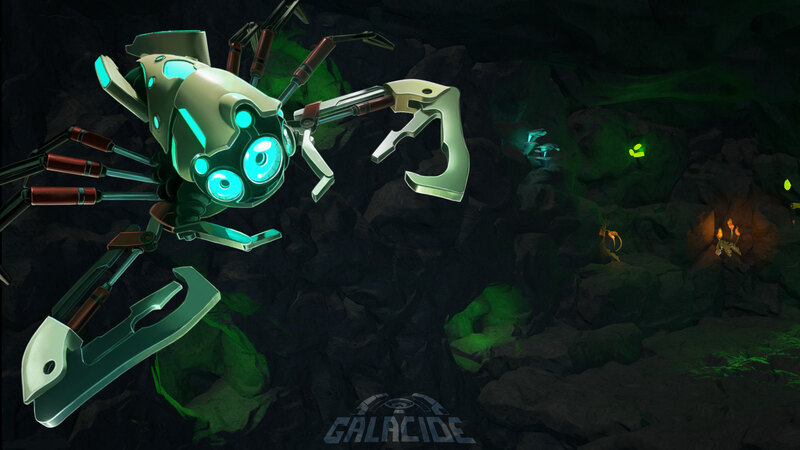 We have performed a major particle overhaul for Galacide. We’ve added new particles for events such as when the player ship is heavily damaged as well as a spark effect when bit arms spawn. There have also been several major revisions to the projectile particles for both player and enemy ships. We’ve also made it so that when you destroy an enemy ship, it will spawn debris. We’ve optimized a lot of the assets for Galacide, which should lead to players achieving higher framerates and smoother performance overall. Added 21 Achievements to Galacide! Combo Master – Reach a combo of 15. Combo Legend – Reach a combo of 25. Big Plays – Get a clear of 10 or more bits, 10 times. Multi-Master – Complete 10 multi-matches. Snake Charmer – Beat the snake boss! Space Truckin’ – Beat Level 2 (Mine Entrance.) Unlocks the Freighter. Set Phasers to Kill – Beat the boss and get to Threat Level 6 on Endless Play. Unlocks the Phase Ship! Threat Level Midnight – Get to Threat Level 10 in Endless Play. War Rig – Store 3 bombs in the Freighter’s cargo. Taking Out the Trash – Clear 500 bits in one level. We’ve Got Hostiles – Get 250 kills in a level. Bombastic – Destroy 3 enemies in a bomb’s explosion. Hat Trick – Kill 3 enemies in one Phase Ship charge shot. 1 Up – Get 500,000 points in Endless Play. High Roller – Get 1 million points in Endless Play. Scholar of the First Bit – Clear all puzzles in Puzzle Mode. The Final Frontier – Travel a total distance of 100,000. Bit by Bit – Clear 25,000 bits total. Galacide – Kill 10,000 enemies total. 30 Puzzles arranged in 5 Tiers of 6 puzzles which test different mechanics. Tier 1: Basic – Tests basic knowledge of matching bits and building off of existing bits to create a match. Later puzzle require some morphing. Tier 4: Linking Turrets – Tests the player’s ability to predict how Linking Turrets will reconnect when their connected turret is destroyed. Also introduces Bombs into the later puzzles. Tier 5: Advanced – Tests knowledge of the most advanced concepts in Galacide. Locked the Freighter and Phase Ship. They are now unlocked through the achievements listed above. Fixed visual “pop” on Mining Vessel jets when entering/exiting warp. Updated player ship colors to be more vibrant. Added lighting to the player ships so they stay bright even in darker environments. Updated low health smoke particle effect. Phase Ship warp drive disabled during phasing cool down as well as while phasing is active. Adjusted distribution of destruction particle effects. Added mesh debris objects to enemy destructions. Fixed vertex normals on Turret model so it responds to lighting properly. Modified Linking Turret connection search to more consistently find the closest connection when multiple turrets are searching simultaneously. Fixed bug with Mini-Boss collision. Added spark effects to bit arms upon spawning. Slowed down the spawn and morph animations. Bit Columns now spawn all the way to the edge of the screen each frame instead of one column per frame. Optimized background assets in the Asteroid Field level. Entering a level now displays the level name in a popup. Combos past 5 now reduce the combo reset timer by 5% (was 2%) down to a minimum of 3 sec. Updated Leaderboard background to the new version. Overhaul of all in-game particles. Applied LOD to more particles. Game now saves whenever you pause in addition to after completing a level. Fixed issue with coloring of gunfire particles. Added a particle management system to prevent early removal of particles with no attached actors. Fixed bug which caused the scrap spawned in the tutorial morphing/tractor beam step to be destroyed immediately after spawning in resolutions higher than 1920 x 1080. Galacide Early Access trailer and Build 5 release! Today we’re releasing an update for Galacide and a new trailer showcasing our gameplay and features! This update includes new enemies, level improvements, a new mini boss, a projectile visual overhaul, and more! As a result of these changes all campaign progress has been reset. We added two new enemies in this patch: the Beam Destroyer and Linking Turrets. We’ve also reworked the two shooting enemies, the Defender and Fighter. They now have multiple shot patterns and scale with difficulty. We continued to work on the first batch of campaign levels, adding in the new enemies and bit sequences, and continuing balance work. The bit sequences are a new feature which adds scripted bit patterns into the levels. This helps us easily tailor the puzzle difficulty relative to the action. We added another boss into the game, Eradicator 29b! He appears in the second level of the campaign, the Mine Entrance, and will also be included among the randomly chosen bosses after Threat Level 5 in Endless Play. We didn’t think the current bullets were very easy to see, and with the enemy reworks there are a lot more of them! The particles themselves got a visual overhaul, and we changed the colors of the bullets to be more distinct. Each pattern has its own color to make it easier for players to recognize and adapt. Added a short invulnerability to player ships after they are hit. Changed Player 4 color from dark blue to dark green. Adjusted player icon and HUD colors to more closely match the ship colors. Slightly reduced the size of the Freighter to match the collision boxes. Updated the enemies’ eye lens material to be more visible from the side. Changed the skin of the fighter enemy to differ more from the normal shooter enemy. Increased the length of the Asteroid Belt campaign map. Improved visual quality of background art, and added some new things! Snake Boss now always fires a bullet at the end of the vacuum phase. Improved the consistency of Snake Boss state changes when he’s injured. Adjusted the timing and location of some of the Snake Boss’s abilities. Updated Snake Boss animations to be more visibly distinct. Adjusted the blend duration on some Snake Boss animations to make them transition more smoothly. Added a short grid effect around cleared bits when a match occurs. Added a screen shake effect when enemies explode. Adjusted scrap attachment position on player ships to a “more correct” location. Adjusted scrap tracer origin to align better with the bitwall. Reduced volume of node pings on the Star Map by 50%. Several Star Map visual updates. Graphics optimizations on the Campaign levels. Firing a scrap and continuing to hold the Fire button no longer instantly picks up an already overlapping scrap. The ready timer now properly resets on the Ship Select screen. The Player ship respawn explosion more consistently damages enemies. The Player spawning slow-motion effect no longer occurs upon initially spawning into a level. Main Menu/Star Map music now loops instead of just playing once and stopping. Significantly reduced the amount of texture popping at the beginning of a level. Chase Grants and Thank You! We’re racing to be eligible for a $100,000 grant from Chase, and need your vote! Please click here, it costs nothing and takes less than 5 minutes! Finally, thank you for following and supporting our efforts, giving us feedback and being awesome! We certainly would have never made it this far without your help! Galacide Sale and Build 4 News! 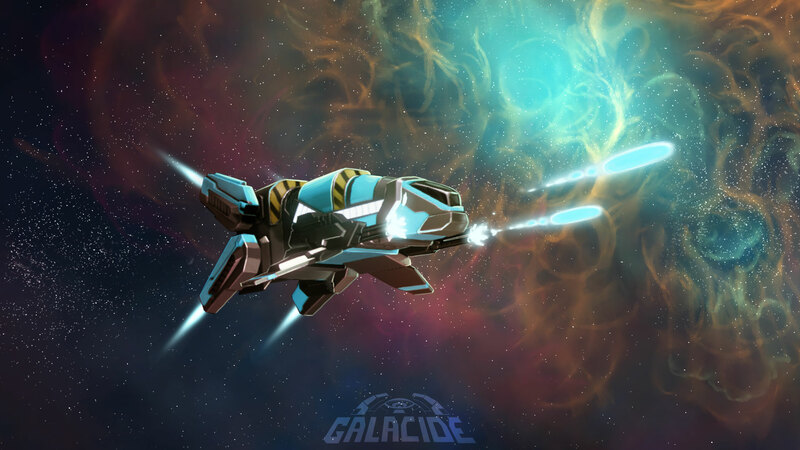 First, we wanted to mention that Galacide is now on the Humble Store and on sale! For two weeks, during Humble Bundle’s Store Spring Sale, Galacide will be 10% off so you can pick it up for $8.99 USD. Right now, we’re engaged in two week “sprints” of work. This means, that we set out to do two weeks worth of work and at the end, we release a big update to Steam! In the meantime, however, we’d like to let everyone know how Build 4 is progressing. This week on Galacide we spent a lot of time working on our first and second bosses in the game, as well as levels for campaign mode. We’ve also been refining the difficulty for Endless mode, making easy a bit more accessible and balancing out the others. 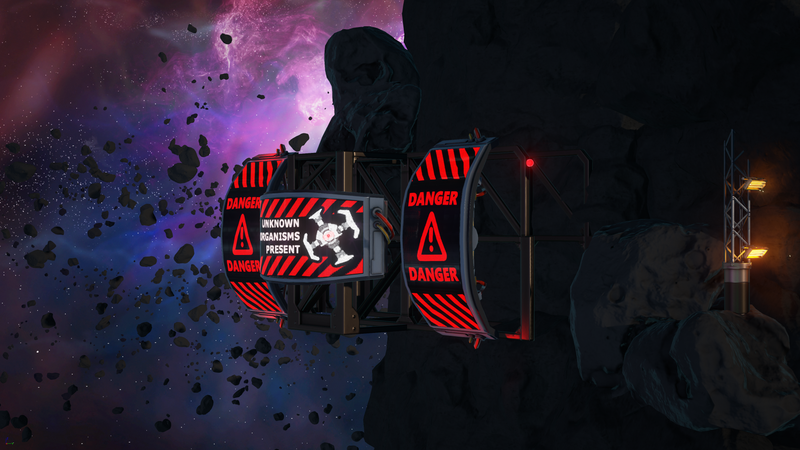 The same prop in use prior to entering an asteroid mine level. What do you think? 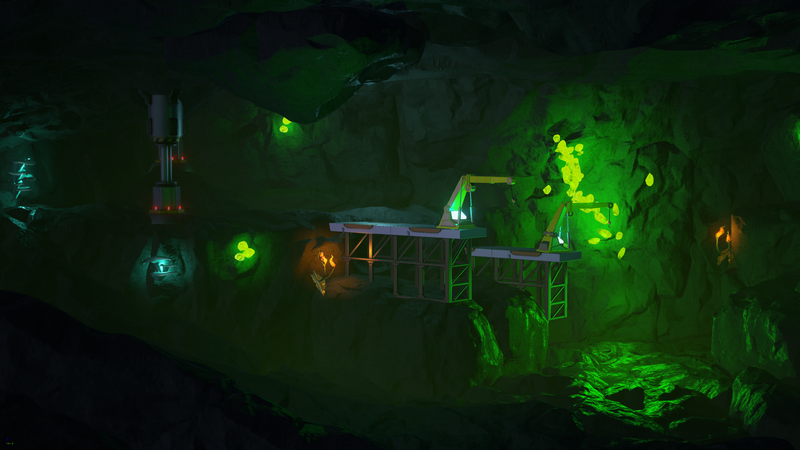 Another shot of the asteroid mine interior. Build 3 – The Phase Ship! Introducing, the sleekest addition to your armada, the Phase Ship! This agile, advanced-level craft has the ability to move through the Bitwall, leaving behind a holographic decoy that shoots at enemies. We felt that, while in Endless Mode, the environment should reflect the waves of difficulties you encounter. Now, when you make it through a wave, the background scene will shift to become more menacing and ominous. Check out the timelapse creation of one of these beautiful background scenes. 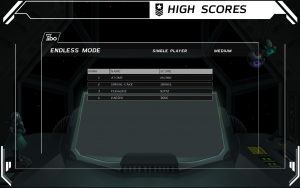 The Scores option on the Main menu is now active and will take you to the new High Score menu. 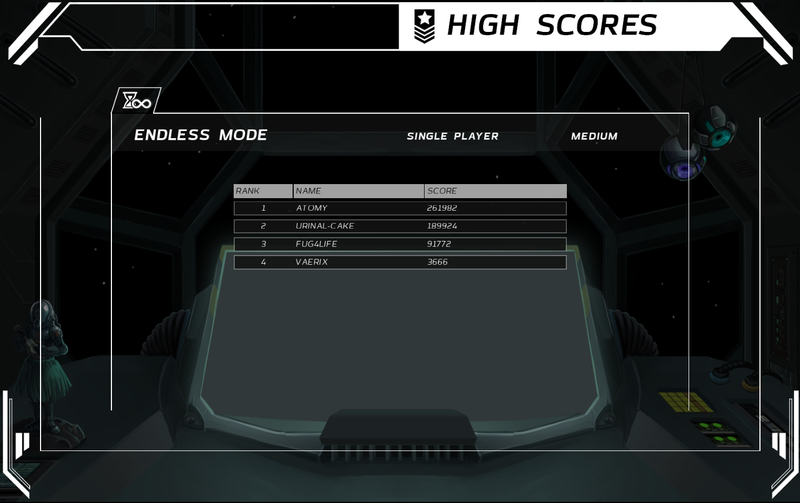 The High Score menu allows you to view top players for single and multi-player leaderboards on all three difficulties. Added a Keybinding menu to the Options menu, to customize movement and combat controls! Added a Credits screen to the Options menu, to see the list of folks making Galacide! Added a splash screen with logos and legal jargon. We’re hitting the ground running pretty hard with a Hotfix to our initial release. This release isn’t super imperative, so it’s not technically a hotfix. However, it fixes a few things we wanted to address in our initial release. It should already be live for everyone on Steam. Added a multi-match bonus, which gives extra score if the player connects clearing bits with other bits of the same color. Added difficulty to the Game End screen in Endless Mode. Added ability to skip high score submission. Added some checks to prevent a crash that occurs around respawning. Added some checks for disabling high score when it shouldn’t be enabled. Added a timeout when submitting a high score, so it doesn’t endlessly try to submit. Attempt to fix problem that caused some bits to be invincible. Turrets no longer keep firing if their parent bits are in the process of being solved. Removed some floating red particles that looked bad. Removed workaround that allows using the Freighter in tutorial.